Summer is on its way and what better way to spend a warm summer day than hanging out in the backyard. With a patio umbrella, you can enjoy the heat of summer while protecting your skin from the harsh rays of the sun. Whether you are splashing around in the pool or having a backyard barbecue party, having the best patio umbrella to escape from the sun while still enjoying the great outdoors makes summer even more of a blast. There are a ton of options out there so we’ve gone ahead and done the research for you. For more of my top gear recommendations, have a look through these popular Outside Pursuits guide links: Portable Grills, Inflatable Hot Tubs, Pop Up Canopies. Here is a feature comparison of my top rated patio umbrellas with a comparison table and our buyers guide below will help you choose an umbrella for you. The Grand Patio is our Editors Choice the the best patio umbrella with it’s quality and features. If you don’t want to have a pole sticking through your table, this 10 ft offset curvy patio umbrella is for you. The banana frame allows you to easily raise and lower the umbrella with a handle and crank. The cantilever design allows you to place tables and chairs or even a picnic blanket under the umbrella. 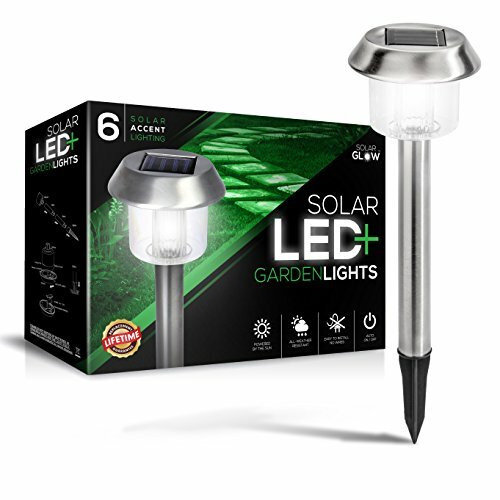 When you purchase this patio umbrella on Amazon, it also includes free solar lights to brighten up your backyard with ease. 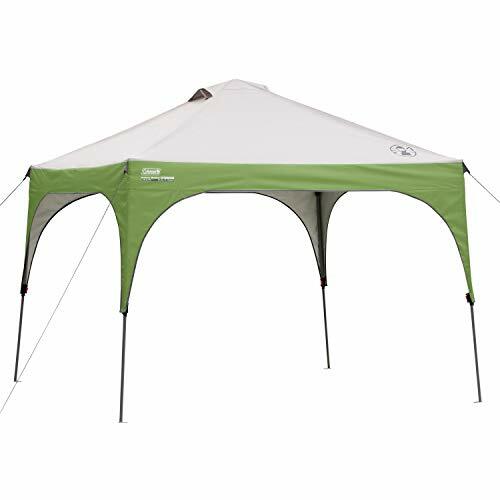 The canopy is sun and water resistant in situations when light rain may occur. The 10 ft deck umbrella offers enough room to comfortably fit one table and six to eight chairs. Unlike many umbrellas, Grand Patio includes the base. This 9 ft crank operated and push-button tilt umbrella features 24 LED lights, 3 one each rib, along with a solar power system. It can also be plugged in with the included adapter. When it is fully charged, it can last up to 12 hours. 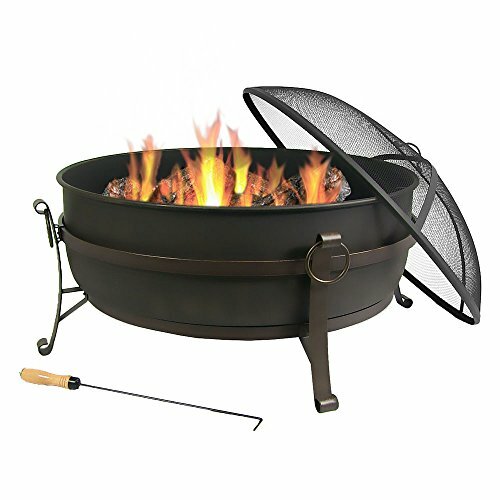 A 40-pound base is required but not included and will need to be purchased to safely use the umbrella. The fade resistant canopy blocks up to 90% of harmful UV rays and features a vent for better airflow and breathability. This 10 ft Cantilever patio umbrella is made specifically track the sun so you can always be in the shade! It easily adjusts with a crank for trouble free operation. The canopy has a vent at the top to help it resist toppling over in windy conditions. It’s an offset design so you don’t have to have it mounted in your table giving you more space. It has 8 powder coated ribs that are rust resistant and the 100% polyester canopy is fade, mold, and mildew resistant and blocks up to 98% of UV rays. It does not include a base and should not be used without one but if you’re looking for the best cantilever patio umbrella, the Le Papillon is for you! This patio umbrella is only 7 1/2 ft but is one of the best outdoor umbrellas that works perfectly with a small table with two to four chairs. The canopy features an air vent at the top and a Velcro band to secure it in place when not in use. The California Market Umbrella comes in by far the widest variety of colors so you should be able to find the perfect match for your furniture. It has a push button for making adjustments to the tilt angle and a crank for easy open and close actions. 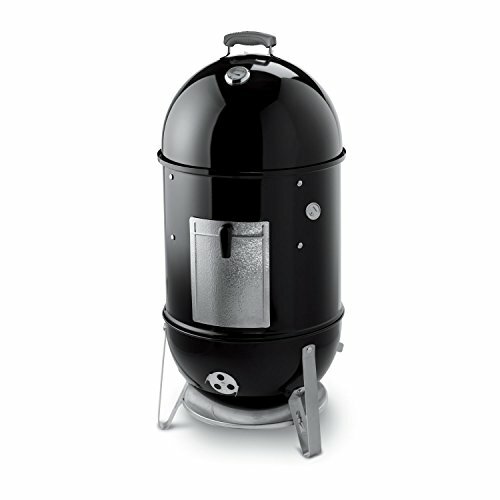 It is available in three different colors with the options for 6 or 8 ribs depending on your preference. The patio table umbrella does not include a base but one is necessary to properly anchor the umbrella so it doesn’t move or fall over in a breeze. This aluminum cantilever offset designed deck umbrella has 8 ribs and is raised by using the crank. The polyester fabric is UV resistant 50+, waterproof, and tear resistant. 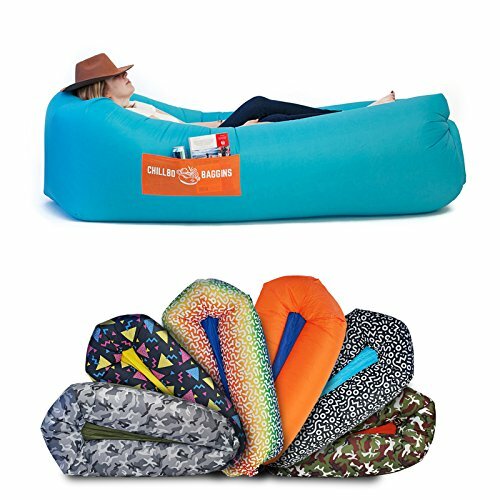 It extends 8 ft high and covers an area of 10 ft. 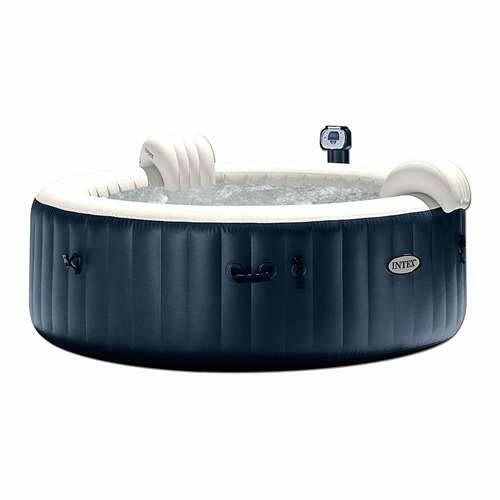 The design makes it easy to assemble though it is important to note that it does not include a base. It is suggested to use a stone or iron base that weighs around 70 pounds to keep the umbrella from toppling over when a breeze is present. The ABCCANOPY with its adjustability is the the best patio umbrella for wind and rainy conditions. However, when the weather turns really nasty, it’s recommended you fold it up. For an extra spacious patio umbrella experience, the 15 ft double-sided one will do the trick. Can be used with or without a table. Fits two picnic tables, a table and a picnic blanket, or several lounge chairs. The umbrella metal base is included and is designed to be used with two sandbags. You can use other means of weighing it down but it does need be weighted down with something to prevent it from tipping over. 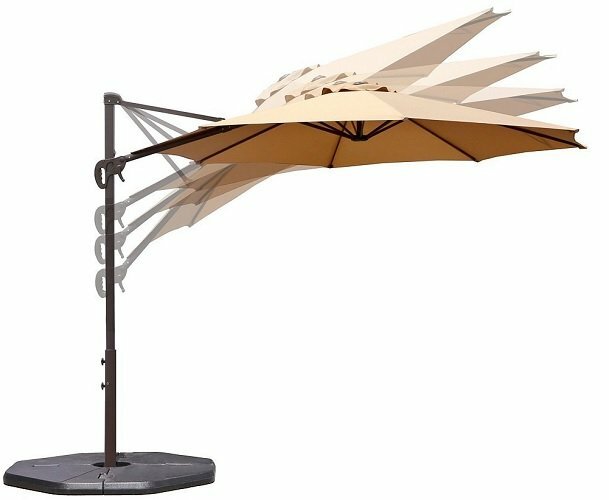 Featuring 3 vents and 12 steel ribs, this patio table umbrella opens easily with a crank. 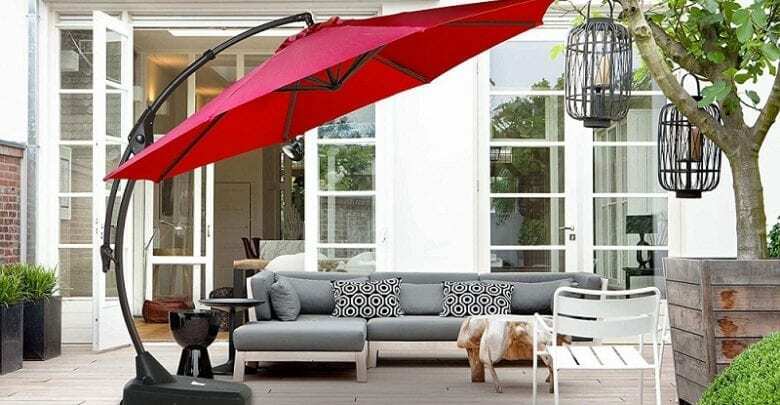 This Sundale Outdoor umbrella can be raised and lowered with the easily accessible crank and the tilt can be adjusted almost 45 degrees with a push button. 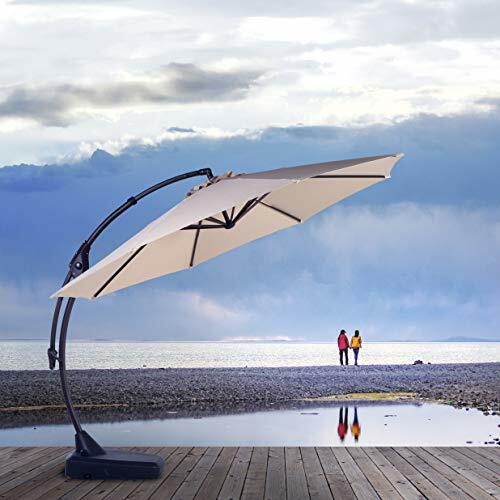 Like Abba Patio umbrella above it comes with LED lighting that comes with a small solar panel on the top of the pole and provides power for the 24 LED lights for 9-12 hours. The base like most umbrellas is not included but can be purchased separately and should weigh at least 40 pounds to safely secure the umbrella. Has enough room for four to six chairs and can be used with or without a table and has a vented top for stability for windy conditions. There are several things that you need to consider before making a purchase of any kind. Buying a outdoor umbrella is no exception. As you can see from the products mentioned above, there are some things that are standard, like the polyester canopy. 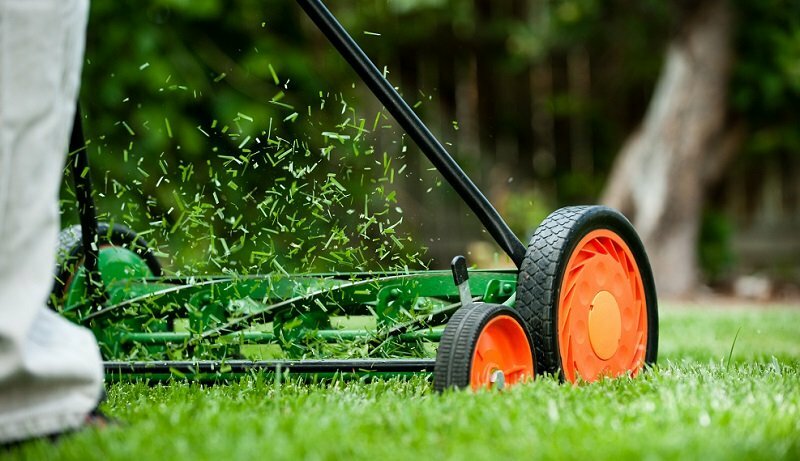 Knowing your options is the first step to buying the perfect product for you and your patio. We will look at six different categories and the options. There are two main styles of outdoor umbrellas. Market – This style is the more common and inexpensive type. This umbrella normally slides into your table through the hole in the center. It then mounts into a base at the bottom. Cantilever Offset – With this style, you can have the umbrella off to the side of the table. They advantage being you have more usable table space since you don’t have a pole sticking up through the table. You can also adjust it more to better block the sun. Large patio umbrellas come in many different shapes and sizes. Some are round or octagonal while others are square. There are even rectangular options depending on the size that you get. In this guide, we mentioned sizes ranging from 7 1/2 ft to 15 ft. There are also some models available in as small as 5 ft. If you are looking to have a single round or square table with the umbrella stuck in a hole in the middle, 5 ft to 10 ft is probably a good size, depending on how big or small the table is. If you want room for two tables or a long picnic tables or even several lounge chairs, the 15 ft double sided patio umbrella mentioned above is probably a better option. Shade umbrellas usually come with two different rib options, 6 or 8. The ribs are the pieces of metal connected to the canopy that cause the umbrella to open and stay up. The number of ribs is generally a personal preference thing but if the ribs there are more ribs, the umbrella is likely heavier but it is probably also sturdier and less likely to collapse or get blown away. All of the patio umbrellas featured in this guide are have aluminum poles. Aluminum is lightweight and rust resistant which is why it is a preferred choice for umbrella poles. Especially, if you will be moving the umbrella around from time to time. But aluminum is not the only options. You can also buy patio umbrellas with wooden or steel poles. If you want a more natural look to fit the style of your patio, you might choose wood. Though wood tends to weather faster than the other options. If you are looking for something that is stronger and more heavy duty, steel is probably the best option for you. If your umbrella will remain stationary aside from opening and closing, the extra weight from the still won’t be a problem. The lift method is basically how you raise and lower the umbrella. Since it is always advisable to lower or close up the umbrella when it is not in use to minimize the wear and tear from exposure to the elements, this is actually a really important feature. There are three methods for raising and lowering patio umbrellas: crank, push up, and pulley. This is the most common and the easiest method for most people. Because it doesn’t require physical strength other than what is necessary to turn a crank. Typically, if you can open a turn a doorknob, you can turn the crank and open the umbrella. One of the more difficult methods though it is still very common. If you are getting a smaller patio umbrella, the push up lift method should be fine. But for larger umbrellas, an easier lift method that doesn’t require as much strength is advisable. When using the push up lift method, it works just like a normal umbrella you would use when walking in the rain. You grab the umbrella pole in one hand and use the other hand to push it up and open. You must continue to push until it clicks and locks into place. When you want to close the umbrella, there is usually a pin or a button you must push to release the umbrella. Be careful not to pinch your fingers or knock yourself in the head when the umbrella is closing. Not very common and is a combination of the crank and push up lift methods. Instead of pushing it up by hand, you will pull on a cord that will pull up on the umbrella, like if you were turning a crank. When you want to close the umbrella, you much push the button or release the pin that locks it in place and you can use the cord to lower it slowly so it doesn’t fall closed on you while you’re still standing under it. There are three different methods for tilting the outdoor umbrella. Being able to tilt the shade umbrella allows you to make adjustments in the angle of the umbrella as the sun changes locations. This method allows you to adjust the umbrella easily from a seated position as long as you can reach the pole, also known as the collar, of the umbrella. You simply have to twist the collar in one direction or another until the umbrella is at the desired angle. The crank tilt is normally use the same crank to adjust the tilt that is used to open and close the umbrella. This is probably the easiest tilt method because you don’t actually have to move the umbrella, like with the collar tilt method, you just turn the crank. This requires you to push a button is probably the most difficult method and usually required two people. One person to push the button and make sure it doesn’t lock again and the second person to adjust the umbrella to the right angle. When you hear button, you probably thing button like on a TV remote but this method uses a metal button that locks into place via a hole in another piece of metal. One plus side to the button tilt method is that it is usually cheaper than other methods. If you just want a simple large outdoor umbrella without all the bells and whistles then extra features don’t mean very much to you. But it is a good idea to know what kinds of extra features are available, just in case you decide to splurge a bit. 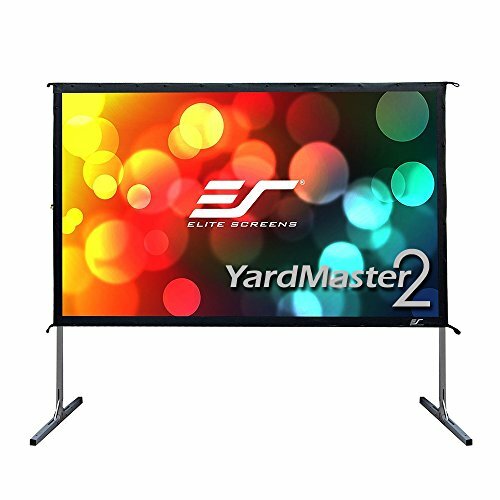 Extra features include but are certainly not limited to: LED lights, solar power, weighted stands (if not included), sandbags and spikes for making sure it doesn’t blow away, and a cover to limit exposure to the elements when not in use. Q: Do I need to buy a stand/base? A: That depends on the which shade umbrella you decide to buy. Some of them are just the pole and the canopy and the base is sold separately. 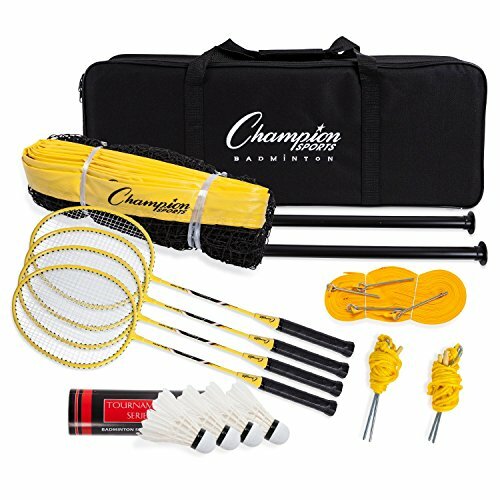 While others come with a weighted base and stakes you can use to tie it down with. Do your research on the specific umbrella you choose to buy. Q: Will the canopy fade over time? A: Yes, over time, the canopy is going to fade. It doesn’t matter which umbrella or color you choose to buy, with enough exposure to the elements, fading will occur. You can limit the amount of fading by choosing a lighter color. For example, red is a beautiful color but it is likely to fade much faster than beige. Also, if you keep the umbrella closed when it is not in use, it will extend the life of not only the color but of the umbrella as a whole. Q: What should I use as a weight to keep the umbrella from blowing away? A: Most large outdoor umbrellas come with a warning not to use it if the wind is stronger than 10 MPH. But if you want to weight the base of the umbrella for those gentle breezes, there are several options. Some bases come with sandbags that you can fill with sand. Some people suggest using old weights for a barbell. Water and rocks are also options for securing the base. Whatever you choose to use, make sure it is securely held in place to prevent potential injuries or damage to the umbrella. Patio umbrellas come in many different shapes, sizes, colors, and methods of use. Deciding which one works best for your patio can be overwhelming but it doesn’t have to be. By now, you should know more than you wanted to know about patio umbrellas and you should have all of your questions answer. Now, I have one more question for you. Are you ready to buy your new patio umbrella? I hope this guide was helpful for finding the best outdoor patio umbrella to fit your needs. If you want to comment or recommend an umbrella I didn’t include, please use my contact form to get in touch.